Extra Large Media Room - Two Car Garage - Private Hot Tub - BBQ - Near Ski Shuttle for Powder Mtn. 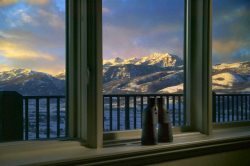 Panoramic mountain views, shuttle to the finest skiing, great snowmobiling tours available, making snow angels by your own hot tub, minutes to boating and fishing ... summer, winter, spring and fall, Moose Hollow, Unit C-105 has it all. Everything is included, plenty of dishes, glasses, cooking utensils, pots, pans, crock pot, coffee maker, Keurig, paper towels, dish soap, dish washer soap, laundry soap, all the towels and linens, etc...we've tried to think of EVERYTHING - just bring your favorite food and beverages to fill up the full size refrigerator...we even have a gas BBQ downstairs by your private hot tub. 2 Car Garage w/ remotes and interior entry door. checking out the entire community. Just got back last week from another incredibly fun trip to Eden. Stayed in unit C105 at Wolf Creek/Moose Hollow. This is probably the 8th year that I have returned to this particular unit and the reason so is because it is such a great unit and very accommodating to my friends and myself. I have had up to 13 people in it one year and everybody was very comfortable. The view from the jacuzzi is amazing, we always bbq at least once every trip out there too and having our own pool table is a real treat. The shuttle bus to/from Ogden/Powder Mountain is so close to this unit and convenient to take especially in bad weather. The Lewis Bros. and Colette are some of the nicest people you will ever meet and deal with. This unit is my annual home-away-from home. Our group of 8 stayed in a 5-bedroom Cascades townhouse (C105). All furnishings were top-notch...I wish I had those couches at my house! Plenty of equipment in the kitchen to prepare our meals, plenty of extra towels & linens to keep 8 people happy for a 5-night stay. But there were several things that set it over the top. A private hot tub with beautiful mountain views, a home-theater room with ample seating, two jacuzzi tubs, a two-car garage, 3 gas fireplaces, and a pool table just to name a few. These kinds of things elevate your vacation to a new level and make the experience memorable Odgen Valley has just enough infrastructure to keep you happy and not too much to lose its rustic vibe. Also, the entire valley is stunningly beautiful. If it didnt have the stiff Utah competition it would probably be a national park.Our group is planning on making this an annual trip...something we werent expecting to all agree on when we initially made the plans, but its an easy choice! We had six adults and really enjoyed our stay here. Booking, arriving and leaving was all a breeze, the place was very nice and very large. Had everything we needed and was really close to Powder Mountain and not a bad drive to Snowbasin, after skiing it was great to relax in the very large hot tub right out the back door of the lower level. The grocery store and liquor store were both very close and convenient (you need to google maps the liquor store or you will never find it.) Not a lot of options for dinning out or night life which was fine, we did have a great time at Carlos and Harleys and we tried the pizza at the Alpine Pizza (next time we will try there pasta). The grill and kitchen were all used quite a bit as was the nice entertainment room downstairs (bring your own movies).